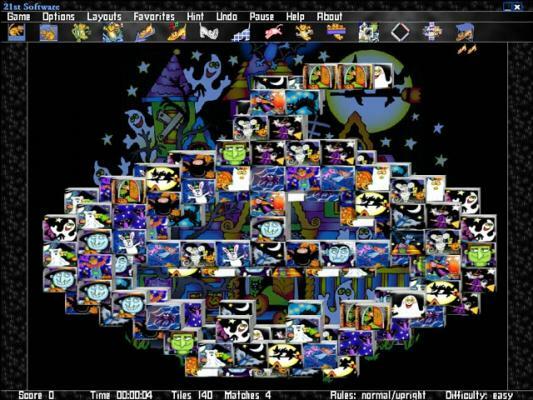 Enable Java to play the original Java Mahjong Halloween game or play this flash Mahjong Halloween. Mah Jong is simple: just click on two matching tiles (with the same pictures). Click the first tile, than the second tile and so on. If two selected tiles match, they disappear. Selected tiles are highlighted. You may select only tiles which have the left margin free or the right margin free or both and which are completely uncovered by other tiles. If the two selected tiles match they disappear from the screen. The goal of 21st Century Mah Jong is to remove all the tiles from the board. If no more matches are available, the game is over If you try to select two tiles that do not match, an error sound will play. To play again click on the replay button. Credit: from Freehalloweengames.com.